Meet the lovely Milo. 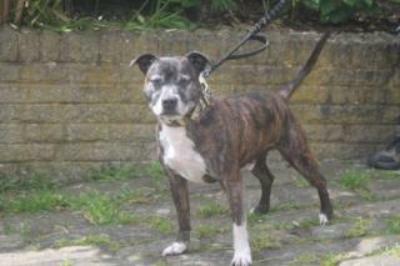 He is an 11 year old male whose previous owner had very sadly passed away so he came into kennels. Milo is a lovely, friendly, relaxed dog, who is sociable around other dogs. We feel that owing to his age he deserves to be the only dog in the household. He has a great temperament so children would be ok, but because of his age they would need to be older than toddlers. We do not think he would like to live with cats or other small animals, although he is not overly interested in them. As Milo really loves toys and enjoys a good play an enclosed garden would be great for him. Milo is part of the EARS Scheme which has lots of benefits for people living in the surrounding area. If you would like to meet Milo please contact the Centre. This is Elvis, he is a 6 and half year old male who was signed over to us by the owner. 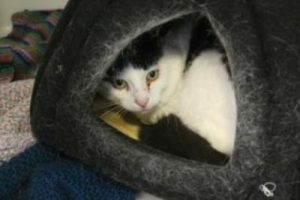 Elvis is struggling in the cattery and is really desperate to find himself a new home, so his life can go back to normal. Elvis will need time to settle down, but once his gets out of the scary cattery we think he will show his true personality. If you would like to offer Elvis a secure happy loving new home please contact the Centre. Elvis is an INDOOR cat. Last month’s pets Geraldine and Scooby were both rehomed. Don’t forget our K9 Party in the Park on Sunday 2nd July 12-5pm at Manor Heath Park and Shibden Dog Day on Thursday 27th July 12-4pm at Shibden Park.